The Bald Eagle was declared the national symbol of the United States in 1782. Ironically, in the lower 48 states, this species was threatened with extinction in the 1950s and 1960s, due to reproductive failure caused by the pesticide DDT. This pesticide was banned in 1972. Due to the banning of DDT, habitat protections provided by the Endangered Species Act, and aggressive reintroduction programs conducted by federal and state agencies, Bald Eagle numbers increased sufficiently to be removed from the federal list of threatened and endangered species on August 9, 2007. The Bald Eagle was among the first species to be listed under the Endangered Species Act in 1973 and among the first to be delisted. This species still receives protection under the Migratory Bird Treaty Act and the Bald Eagle and Golden Eagle Protection Act. The Bald Eagle is a true North American species breeding and wintering from Alaska, across Canada, in most of the United States, and northern Mexico. Description: The sexes are alike in plumage, but the female is approximately 20% larger than the male. The adult Bald Eagle is unmistakable with its all white head and tail. The body is dark brown, and the bill, eyes, legs and feet are yellow. The legs are unfeathered. In flight, the wings are long and broad, and held flat while soaring. Bald Eagles do not reach adult plumage until they are 5 years old. Immature plumages vary greatly with age, but include a mix of dark brown and white scattered throughout the plumage, while some first year birds are all brown. During the first 4 years the bill is blackish, becoming light at the base, the eyes are brown, while legs and feet are yellow, like the adult. Adult and immature Golden Eagles look like immature Bald Eagles, but they have feathered legs, the white on the underside of the wing is limited to a patch on the flight feathers, and they soar with the outer part of their wings lifted in a slight "V". All immature Bald Eagles have a varety of mixed brown and white feathers on the breast and wings. Golden Eagles are rare in Tennessee in all seasons. Habitat: Breeds in forested areas near large bodies of water. 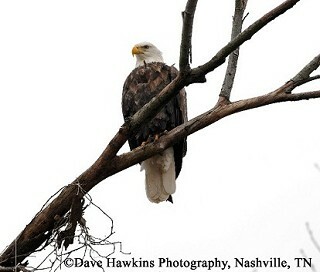 Bald Eagles winter on reservoirs and large rivers in Tennessee. Diet: Opportunistic feeder, but prefers fish. Bald Eagles will eat large birds, injured waterfowl, mammals, and carrion. Nesting and reproduction: Bald Eagles form long-term pair bonds that usually last the life of the birds. In Tennessee, egg laying peaks in late February. Clutch Size: Usually 2 eggs, but occasionally 1 or 3 eggs. Incubation: Both parents incubate from 34 to 36 days. Fledging: Both adults feed the nestlings, which leave the nest in 10 to 12 weeks. Young birds usually remain near the nest for another several weeks. Nest: The male assists the female in building a large bulky nest in the top of a large tree near an opening that can accommodate their large wingspan. The nest is used for several years with new material added each year. Old nests can reach 8 feet across and 12 feet deep, and weigh several tons. Status in Tennessee: The size and distribution of the Bald Eagle population in Tennessee, before the continent-wide population crash in the 1950s to mid-1970s, is unknown. However, there were no known successful Bald Eagle nests found in the state between 1961 and 1983. Efforts, coordinated by TWRA, to restore Tennessee's eagle population began in 1980 and continued until 2003, and young eagles were "hacked", a form of reintroduction, at several locations in the state. The first successful Bald Eagle nest was discovered near Dover, TN in the spring of 1983. There are over 175 nesting pairs of Bald Eagles in Tennessee today (as of 2012), and most of these birds remain in the state year round. Individuals from more northern breeding populations migrate to Tennessee for the winter, arriving in late October, and peak numbers of 300 to 500 individuals occur in late January to mid-February. The "bald" in Bald Eagles comes from an old English term meaning white, referring to its white head. The life span has been recorded at 39 years in the wild and 50 years in captivity. Horizontal flight speed has been measured at 44 miles per hour. Best places to see in Tennessee: In winter: Reelfoot, Dale Hollow, Kentucky, Chickamauga, Watts Bar, and Pickwick Lakes.